There are multiple ways you can go about the finding the VS instances installed and determining the tools installed for each instance. %dir% now contains the root installation path, if available. For a more specific example of using this COM API from C++ to list installed instances that include Visual C++ tools, check out this sample on GitHub. It is inside PrintPackageReference function that my sample checks the name of each installed component in the instance to determine if the Visual C++ toolset is installed (i.e. 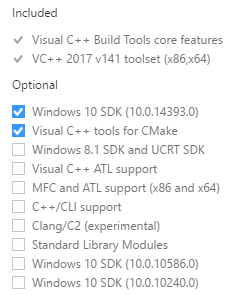 if “Microsoft.VisualStudio.Component.VC.Tools.x86.x64” is installed). Note: This sample is not an official tool and is meant simply to instruct how to leverage the COM API to locate the installed Visual C++ tools. Below is a table of the underlying names used to describe each C++ workload, as well as the underlying component names used by the installer for the options provided in each workload. 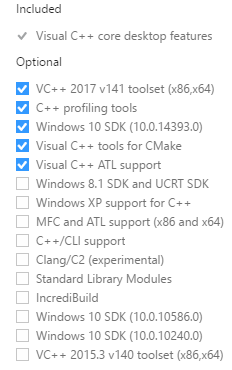 The Visual C++ 2017 v141 compiler toolset component (x86 and x64 targeting), known as Microsoft.VisualStudio.Component.VC.Tools.x86.x64, comes included in the desktop workload as a recommended (pre-selected) component and is a required (always installed) component in the C++ game and build tools workloads. 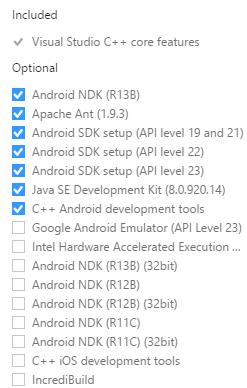 *C++ Universal Windows Platform development tools are required to be installed for C++ UWP development but are not installed by default. 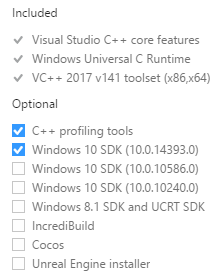 *The Visual C++ Build tools always installs the VS2017 v141 toolset. <tgt_arch> is the architecture upon which the produced binary will run (x86 [default], x64, arm). <host_arch> is the architecture for which the compiler/linker was built (i.e. do you want cl.exe/link.exe, itself, to be able to make use of 32-bit or 64-bit address space) (x86 [default], x64). We have now configured our command-line build environment so that it knows where the correct VC++ tools are based on our preferences(host/target). In a world where multiple version of VC++ tools could be installed in a single VS instance, we have introduced the concept of <VCToolsVersion> which indicates the default version of VC++ tools for that VS installation instance. If you plan to manually assemble path to the VC++ toolset directory, we need to know the default version of the installed tools to get the full path. The <VCToolsVersion> is found in one of two files that can be located once you have a <VSInstanceDir>. You can check out the batch script located <VsInstanceDir>\Common7\Tools\vsdevcmd\ext\vcvars.bat as an example of how the VS Developer Command Prompt does this. Since we have removed the VS150COMNTOOLS registry key to support the new world where multiple VS instances of the same product can be installed side-by-side on the same machine, we know that many build systems and tools have relied on this in the past and the new options are not an identical replacement. We are actively working with library developers and others with builds that depend on the VC++ compiler tools, and we are open to further feedback to help refine and improve upon the solutions mentioned above. Please share any feedback you have in the comments or feel free to send more detailed suggestions to visualc@microsoft.com.